Geckos are tiny creatures with many natural predators. Snakes, frogs, small birds and other, larger reptiles all hunt geckos. As a result, geckos have become masters at defending themselves. Part of their defense mechanism is passive -- run and hide -- but some geckos can become aggressive when confronted or when they're afraid. Probably the best known defense mechanism of geckos is tail loss. This is just what it sounds like: when a gecko is grabbed by the tail, the tail will detach and keep moving on its own. This distracts the predator long enough to allow the gecko to run away. Losing the tail does not cause the gecko any injury -- just some very minimal blood loss. The tail then regenerates itself, so it can be used as a means of defense and escape again if necessary. Some but not all geckos can change colors at will to mimic the environment. This allows them to protect themselves by blending in with their surroundings and becoming almost invisible to predators. For example, the satanic leaf-tailed gecko -- which lives in the forests of Madagascar -- can change from orange to green to brown to yellow depending on the colors of the forest around him. Geckos have excellent sight, hearing and smell. These senses are very useful when stalking prey -- most geckos hunt insects for food -- but also to alert geckos that a predator is nearby. Once a predator is detected, each gecko reacts differently. Some might run off at fast speeds, while others might get very still and try to blend in in hopes that they're not seen. This is a passive defense mechanism. Not all geckos bite. Some are shy and will stay away from human -- or animal -- contact as much as possible. Other geckos will bite if other animals or human fingers get too close, even if you don't intend to harm them. 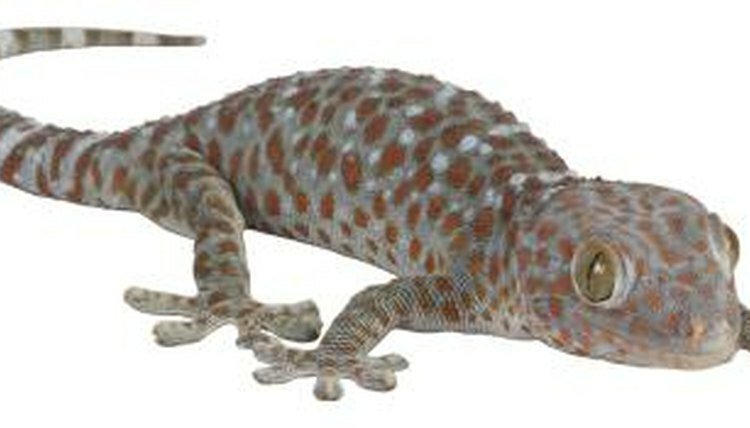 For example, tokay geckos -- colorful geckos of up to 12 inches -- bite without much provocation. Leopard geckos, on the other hand, are friendly and docile and much less likely to bite to defend themselves. What Traits Help Geckos Live in Hot Dry Places?